The solution provided by Brady is proving to be transformative. We are proud of our partnership that has not only resolved an issue, but saved valuable resources and improved customer satisfaction. Brady (NYSE:BRC), a global leader in industrial and safety printing systems and solutions, today announced its contract with Grand Rapids, Michigan, to provide labeling solutions for the city’s 96,000 residential refuse and recycling carts, and 20,000 construction dumpsters. 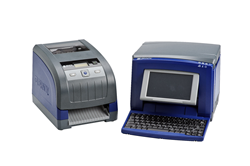 The city is using Brady’s BBP®33 and BBP®31 printers, durable vinyl label materials and LabelMark™ software to solve collection cart identification challenges. The Grand Rapids “Pay-As-You-Throw” curbside refuse and recycling collection program provides residents with smart carts that each contain an RFID chip. The carts are then RFID-scanned upon collection to charge the resident based on refuse cart size, while recycling is free and includes a point-based rewards program. Brady’s solution includes durable vinyl label materials and two label printers, including a BBP31 printer installed in a trash collection truck with an inverter to allow workers to create labels on-the-go for carts. It also includes LabelMark6 label creation software used on the BBP33 printer to allow workers to easily import spreadsheet data and print the cart labels needed for the residents on their route. This effort not only assisted in collection employees with identification but it helps customers know which cart belongs to their address. The city of Grand Rapids believes the new smart cart labeling system from Brady will result in improved customer service, enhanced efficiencies, decreased cart replacements and reduced billing disputes.